This report is provided pending a more detailed news article being written. Images in sequence of the action are contained within, currently without comment. Tonight, Thursday, August 16th, Walt the Chemist's report on water tests aided in the people's decisions to press forward with a plan. Mayor Ga'kuct of PaxLair City was extremely skeptical about the plan, seeing it as an "ebil" plan. The Mayor is keeping a close eye on the level of water in the Spring of Courage; he will be very upset if the water level goes down as people take water from the Stream of Courage. A group of adventurers did manage to find an outflow from the Stream of Courage and obtain water from the Spring of Courage. The adventurers then anointed paladins Nanoc and Phoenix as diplomats from Dragons Watch for entry into PaxOku. The PaxOku Well of Souls did not react to their passive presence. The adventurers placed water barrels of Spring of Courage water around the Well in PaxOku, but did not pour any water into the Well. Much occurred at the Well and about 12 people gathered. Screams were heard from Paladin souls from inside the Well. Daine, who was turned to human after entering and returning from the Well a few nights ago, also came to offer her sensations and memories about the Well. The Gatekeeper was present for some time, and Valtos the Void [an evil questmaster] also appeared for a brief moment. Earlier in PaxLair City, Sebrina of Moonglow encouraged all to help bring water from the Fountain of Truth in Moonglow; the water will help nourish the citizens of PaxOku. People are needed to fill barrels of water and ship them to PaxOku. The adventurers also thought that waters of the Fountain of Truth may have special powers of some kind, just like waters from the Spring of Courage. The alchemist will be called in again to test waters from the Fountain of Truth. There was even talk about water of Love, if such a Spring or Fountain exists. Perhaps it is "lava" of Love; people currently just speculate. From the "good" point of view, the next steps dealing with PaxOku's Well of Souls are not yet totally clear, and many options are being proposed. A major step will likely be to retrieve lost souls from within the Well that may not rightly belong there. Images from the adventure are below. 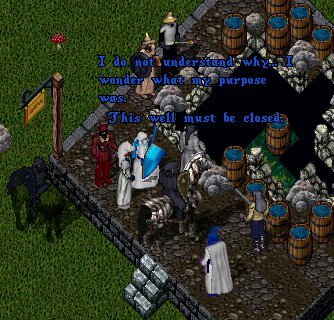 Paladins, Mages, and PaxLair Statehood officials found that water from PaxLair City's Spring of Courage actually protect Paladins from the evil of a Well of Souls. A small group gathered mist from the Spring of Courage, took it to Mazrim's Tower of Souls, and saw the effect. The Well of Souls flamed abruptly at the Paladins, but the Paladins were previously anointed by the Spring Water and were not hurt. This may prove to be a valuable fact in overcoming the perils in PaxOku at its Well of Souls. This occurred after Paladins NANOC, Phoenix, and Elijah Cross along with Lady of the Spring Winmere, Minister of Quests Eric the Red, and Governor Winfield were summoned to meet with The Gatekeeper. The Gatekeeper made a rare appearance at his Gate to the Underworld informing these people about the waters of the Spring of Courage and the nature of the Wells of Souls. With the Spring's water tested, a course of action to use the water to aid PaxOku can be further executed; this course was proposed at the August 14th PaxLair Statehood meeting. An abundance of water from the Spring of Courage in PaxLair City must be collected; however, only water mist may be collected directly from the Spring. People must find an outflow from the underground Stream of Courage that is connected to the Spring. An outflow once existed at Lake Hammerfell and Dungeon Shame in Felucca. Water tests are needed to know if the Stream still flows into these places. Paladin NANOC also collected bottles of vile waters from Mazrim's Tower of Souls to be tested by a chemist of the Realm. A chemist report should be completed within the next 24 hours or less. The strategy is for Paladins and others to then find and take large quantities of Spring water to PaxOku; the Paladins will be anointed by the Spring water for protection. The plan is expected to be carried out soon. People interested in aiding or observing this mission may reach Mayor NANOC of Dragons Watch or Paladin of Virtue Elijah Cross from PaxLair City. Or, people may be diligent in keeping an eye on activity in PaxOku. Below are more portraits of this recent activity and information about the Spring of Courage and Tower of Souls. Mayor Gareth met with Pholcus Boxeur the council chair of the VoidQueen District of PaxOku City. During their talks the district wishes to become a Village residing within PaxOku city. At first the Mayor with just coming back was in a bit of shock at this. The councilwoman feels that if it were to be given village status it would make the people who live there feel safe. For it to be their own. She went on to tell that within all the cites besides Umbra, people who walk her path have no village or city of their own. This could also promote a safe haven, neutrality and a better way to live. After much discussion behind doors. Mayor Gareth announced he is granting the district the ability to become a village. As of now the village will be called the The Village of VoidQueen. The citizens of the newly founded village will be asked to name the village. A viceroy is to be picked to report to the Mayor. Councilwoman Pholcus Boxeurplanned to step down as soon as Neira of RBG was ready to take over as the councilwoman. Now it is up to Neira to choose if she wishes to become the new Viceroy of the village. The Village will need to come up with a charter and village government. It will need its own guards to patrol it as well. Sarberius and the Death Knight Daine stood side-by-side, looking deep into a ruined well... The Shadow stood behind them, watching. Sarberius was the first to take her life and enter the well. I am dead already, and should be able to return from the Well... differently. If I do not return, that is only fewer days of torment for me. I am only alive because the Dark Lord of Gehenna seeks to use me for his evil. The light within me is small. If I can get to the bottom of the Well, perhaps I can overcome that light, which the Dark Lord uses against me, and be free from him, and more powerful. If not, that light will merely be extinguished on its own, and the good part of me may rest in peace at last, and no longer will I torment. We had a PaxLair Weekly meeting PaxLair City. 1. Mayor Katherine still trying to assemble mediums to attempt to contact Mayor Gareth inside the Well. 2. Spring of Courage water may be available via the underground Stream of Courage connected to Lake Hammerfell (old city of Haven on Felucca, south of Trinsic). Idea is to caravan/ship the water to PaxOku if chemists can determine the Stream of Courage still flows into Lake Hammerfell. 3. Speak to the Evil Gareth. He was at the meeting last night and wanted neutral humans to sacrifice themselves into the Well of Souls in PaxOku. I hear some people went to PaxOku and performed some sort of ritual, but I don't know what happened. Oh, and Mayor Katherine re-instated the PaxOku Decree Banning Paladins again since a Paladin was hurt by the waters in PaxOku recently. We covered a lot in the meeting last night, to include new developments in PaxLair City and Dragons Watch. Lenora will have a grand opening of the new Pizzeria in PaxLair City at 10 PM ET next Tuesday after the PaxLair meeting (August 21). Justine will be finding a location for a new pub as well, for "dancing" to include feo-orcies dancing. Mayor Ga'kuct anticipates there may be more "clompin" in PaxLair City soon so he is looking for those wanting to "clomp". Evacuees from PaxOku are welcome in PaxLair City at the Paladins Fortress in the East Meadow. Several more buildings were constructed in Dragons Watch with several new members in the past couple of weeks. The elves are still preparing water in massive quantities to ship to PaxOku to help with the water shortage there. 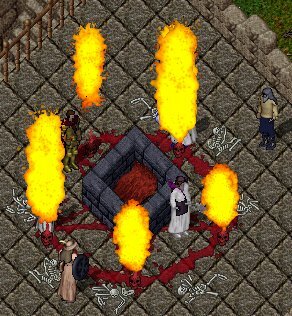 In light of recent events in the city of PaxOku with the appearance of the well of souls and the death of Mayor Gareth, I am lifting the ban on paladins entering the city. Furthermore, I humbly offer my thanks to any paladins who wish to aid the city and its citizens. Mayor Gareth dead! Evil Gareth on the Loose! More damage in PaxOku! After an unfortunate but necessary absence from the Realm, I undertook a full inspection of the city. The results are disturbing. The corrupted water has spread northeast into the VirtueWind and PaxKrat Districts, polluting the entrances to both my Museum Annex and Mayor Gareth's office. The Blue Light and DukeLoth Districts to the southwest are also showing damage. Worst of all, the VoidQueen District appears to be a total loss, with some unknown devastation taking out the buildings there. In addition, what used to be the PaxOku City Well is destroyed as well, with an apparent entrance to the Well of Souls wide-open. The evil Gareth, thought to be destroyed, is now loose among us again while Mayor Gareth is dead. However, mediums in our midst have made contact with his spirit in the well, and it is hoped that a large concerted effort by multiple mediums may gather more information. I humbly ask that the citizens of PaxOku, as well as any other citizens of the Realm that may assist, give me any assistance you can offer. I am open to any and all suggestions right now for dealing with the disaster that has befallen our city. Last night Mayor Gareth was killed by the well and his soul sucked into the well of souls or the underground water river...we are unsure. In government the powers would fall to the Deputy Mayor. Problem being the Deputy Mayor is missing. Now it falls onto Miss Kayi the City Council Chairwoman. Another problem is she just came back from a long trip and has no clue on what is going on. She gave her emergency government power to Lady Katherine. Chairwoman of the VirtueWind District. The following has been issued from the Emergency Mayoral Power of Lady Katherine. -The DukeLoth district is to be evacuated. -The VirtueWind district is to be evacauted. All displaced citizens are to report to the Teahouse and Silent Rose Library for a place to stay. Also uncharted water way has been found going to the eastern side of PaxOku. PaxOku Government Cover Up Revealed!!! Neira and Lord Gareth were seen at the now almost completely destroyed well speaking. It would seem the newly dug well may have a slight problem...It was said that when the digging began they may have damaged the blackrock area that lines the well of souls in PaxOku. The well of souls may take in souls but, must remain balanced. For if you sacrifice to many virtuous people the well will become Anti Virtue. If you sacrifice to many Anti virtuous people it will become virtue. The well itself must always have balance so it may remain neutral. Alas since they damaged the lineing of the well of souls all of the Paladins that were exictued within PaxOku the well took in. It is my beliefe that the reason the well and now water supply in the city reacts with such a destructive force would be, the well does not need anymore Paladin souls. Now the water supply being connected to the well of souls has spread the effect over time down the supply line. The now explosive supply has reached the entire VoidQueen district of PaxOku. It is now flowing to the DukeLoth District and soon the VirtueWind district. It has infected the Angelic's Crafters hall. The tailors layed Goza mats down to cover up the disgusting smelling water. We have infact found a flow chart of this well supply in the Silent Rose Library. The Red shows where it flows and the green shows where it has already reached. From what the Mayor has released to us tonight. The following will be announced at tonights Pax meeting. 1. The VoidQueen District is under a complete evacuation. 2. DukeLoth District under a voluntary evacuation. This may change within the next ten hours as we watch the flow. 3. VirtueWind District under a voluntary evacuation. 4. Blue Light District under warning. The well of souls has infact mixed with the water well below the city. We know how the well of souls reacts on it's own but, have never planned a senario to where it would be free to flow around the city and mix with water. Also with it being unbalanced we have not prepaired for that. Governor Winfield declares the PaxOku Decree of Banning Paladins from the city as lawful. This evening's hearing regarding the PaxOku decree banning paladins from that city and its possible conflict with the PaxLair Statehood Neutrality Law was held at the Mages Tower in PaxLair City, Felucca. Governor Winfield himself largely directed this third session of the hearing, asking clarifying questions of the two main parties involved: Mayor NANOC of Dragons Watch, also a paladin; and Mayor Gareth of PaxOku. Governor Winfield asked Mayor Gareth some more questions about the vision of the well being polluted that led him to issue the decree. Perhaps the most shocking part of the hearing was when the Sheriff of PaxOku, Lady CaT, demonstrated that the water from the PaxOku well reacted violently with a Luna Lance. This was a primary reason of concern that led to the Mayor banning paladins from the city, to ensure the protection of the water supply.